Product prices and availability are accurate as of 2019-04-22 19:45:04 UTC and are subject to change. Any price and availability information displayed on http://www.amazon.com/ at the time of purchase will apply to the purchase of this product. 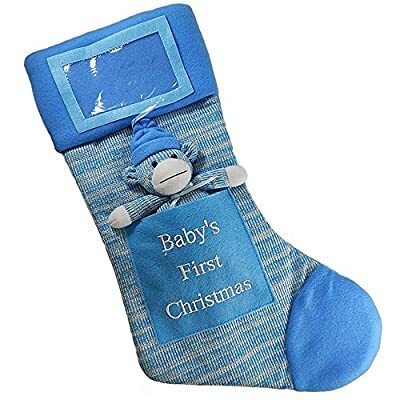 Celebrate your baby first Christmas with this adorable personalized Christmas stocking! Babys First Christmas Stocking Made of Felt & Knit Fabric! This stocking measures 19" from the top corner to the tip of the toe. Comes with removable Sock Monkey Soft Toy that can be hung as an ornament! Babys First Christmas Stocking Made of Felt & Knit Fabric! This stocking measures 19" from the top corner to the tip of the toe Comes with removable Sock Monkey Soft Toy that can be hung as an ornament! Comes with Picture Frame - Personalize it with baby's picture!